Do you like chocolate chip cookies, the kind that are soft, dense, and cakey? Do you like chocolate? Oh boy. Do I have the recipe for you. These babies are rich, indulgent, and made to pad thighs. Did I mention they are tasty? Yeah. 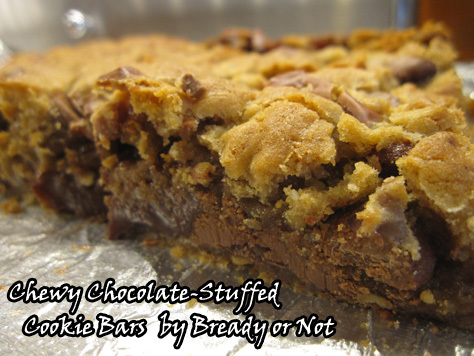 These are chewy in the best kind of way. 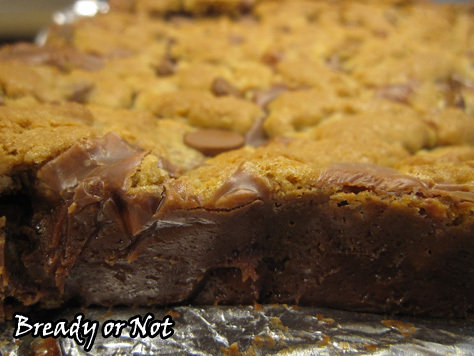 I prefer using milk chocolate chips, but you can tailor these to your taste buds. Go semi-sweet or dark. Mix them all up. Be crazy. 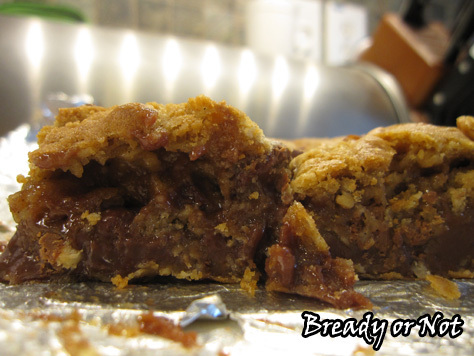 The filling in these bars is rather like a ganache, so it will soften a lot if it’s at room temperature or warmer. I found they kept in the fridge really well in a sealed container. They keep well in your belly, too. Simple to make. Divine to eat. 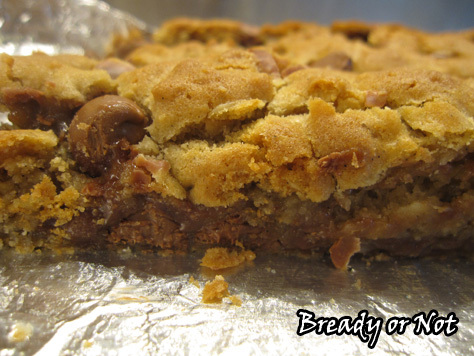 These are diehard chocolate chip bars–rich, lush, and chewy. Store sealed in the fridge for days… if they last that long! Place the chocolate chips and condensed milk in a microwave-safe bowl and heat for 40-50 seconds, watching it the whole time--condensed milk can turn to lava if you're not careful! Stir well, and heat again if necessary; the chocolate chips should blend in. Once that happens, add the vanilla extract and stir in. Set aside to cool to room temperature. Preheat oven to 350-degrees. Line a 9x13-inch pan with foil, overlapping the sides to make it easy to lift out later. Spray foil with nonstick spray or rub with butter. Place the butter and both sugars in a large bowl. Beat until smooth and creamy. Add the eggs and vanilla. In a separate bowl, combine the dry ingredients: the flour, oats, baking powder, baking soda and salt. Gradually add to the butter mixture until everything is well incorporated. Stir in the chocolate chips. 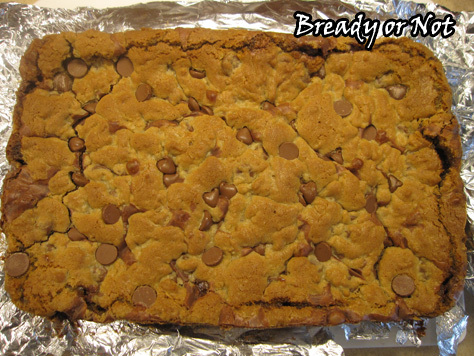 Place about half the cookie dough in dollops in the ready pan. Gently smooth it out to cover the bottom. Pour the cooled chocolate over the dough. Top that with the remaining dough in dollops; don't worry about covering the whole surface. Bake for 20 to 25 minutes, until the top is just golden brown. Cool completely. Use the foil to lift it out of the pan to cut. Store in a sealed container in the fridge, as the middle will soften at room temperature. I originally posted this on Facebook, and it had such a good reaction that I decided to post it on my blog as well, as I know some family members subscribe to my blog feed. 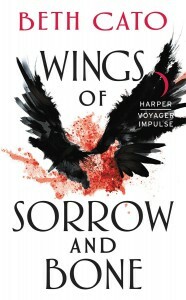 The TL;DR version: Wings of Sorrow and Bone is a Nebula nominee in the novella category. This is a HUGE deal. I was asked what a Nebula nomination really *is*. It’s comparable to an Oscar nomination, I suppose. Within science fiction and fantasy fiction, the Nebulas (voted on by members of SFWA, a professional writers’ organization) and the Hugos (voted on by supporters and attendees of the annual WorldCon) are THE biggest awards, followed by others like the Locus Award, World Fantasy Award, etc. Being a Nebula nominee is a huge deal. It’s the kind of thing that gets mentioned on book covers and in reviews (it can also lead to book deals and reviews). It’s high validation from my peers. Go look at Wikipedia at the works that have won these awards–I bet you’ll recognize names and titles! Wings of Sorrow and Bone is a Nebula finalist. I’m gobsmacked. I’m thrilled. I’m terrified. Within five years, I’d like to have a story or novel make the shortlist for a Hugo or Nebula. I’d also like to have a poem up for the Rhysling Award. This week I confirmed that, for the second consecutive year, I have a poem nominated for the Rhysling. Then this. The big one. The Nebula nomination. I actually made my goal a year before my deadline. How funny is that?! I guess the next goal should be to actually win a Hugo or Nebula at some point. 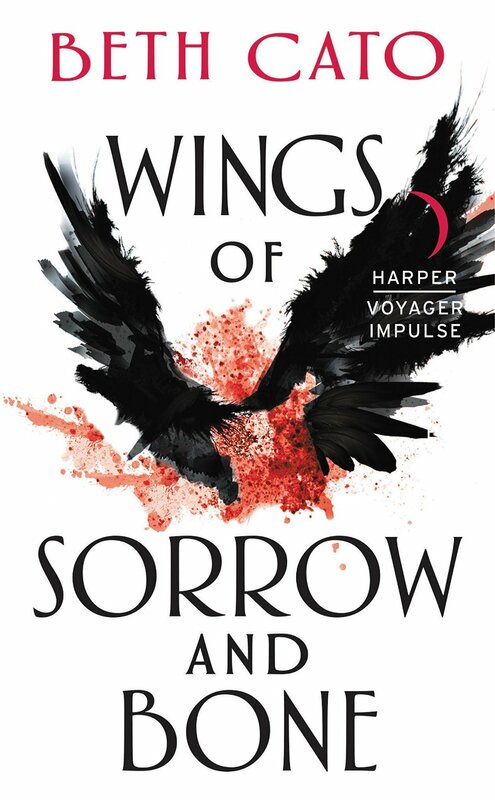 Wings of Sorrow and Bone is available at all online retailers for just 99-cents. Check it out–it seems people actually like it! ?